One of the most common crafting hobbies is candlemaking. Many crafters will agree that the best DIY candles are the ones that don't take a ton of time and energy to make. ​If you're just getting started, it's wise to stick to projects that are simple and easy to complete. You might think that it's intimidating to make your own candles from scratch, but the process is not as daunting as it seems. These tutorials will show you how to make candles to sell or gift without needing to invest a lot in supplies. The first candle you'll want to master when you get into candle making is a basic jar candle. Keep the fragrance and color simple and practice until you feel comfortable with the process. Just about any glass vessel can be remade into a wax candle. Look around your home for mismatched glassware and get creative. Once you master the basics of candle making, try to experiment with different fragrances. Need some inspiration? You can't go wrong with a combination of rosemary and lemon. Citronella candles can get expensive and could have a bunch of unnecessary fillers that aren't the best for you or the environment. Learning how to make your own is a simple and straightforward process. 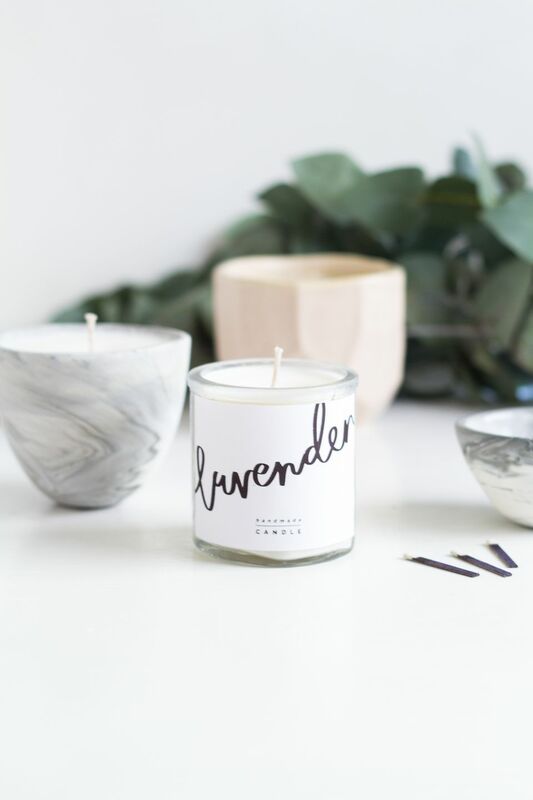 If you want to start selling your candle creations, take the time to print out attractive scent labels. You can find many free examples online or use a free graphic design program like Canva to make your own. If you want to add a fun, youthful element to your beginner candles, mix in some colorful sprinkles. Burn this cake-scented candle in lieu of a traditional birthday cake. If you're someone who loves pumpkin spiced everything in fall, try your luck at this beginner candle tutorial. Vintage advertising tins are highly collectible. If you find an unusual tin for this candle project, chances are you'll never want to burn it and that's okay. This candle making project is so simple that even a child could do it! Once complete, decorate a dining room table centerpiece with a variety of beeswax pillars in varying heights and widths. These cute candles make an excellent Easter centerpiece, but they also would look cute all-year round on a kitchen shelf. It's easy enough to add essential oils to your candle. Take the candle DIY one step further by pressing herbs against the glass jar. If you are apprehensive to pour a candle, start with one of the most basic candle transformations. Search for plain pillar candles throughout your home and decorate them with rubber stamps. Do you know someone with an affinity for all things antique? These cute teacup candles make great gifts for vintage lovers. This candle tutorial will teach you how to make small tin candles that are the perfect size for party favors. Make them extra glitzy by adding tons of glitter to the wax. If you want to add color to your candle wax without spending extra money on supplies, check to see if you have any old crayons. This candle tutorial is designed to be so easy that a child could make them with you. When candlemaking, try out a ton of different scent combinations. If you get stuck, look to candle tutorials for inspiration. The combination of sandalwood and fig in this candle DIY is woodsy and perfect for winter. If you don't want to have to mess around with melting and pouring wax, try out this candle tutorial that uses olive oil instead. In this "candle" tutorial, you won't have to worry about placing a wick perfectly. Instead, make extremely easy wax melts that can be used in any wax melter. Brewing tea fills your kitchen with amazing smells, but why not have that scent linger throughout your entire home? Pick any tea that you love to savor and convert it into a candle. In most cases, a candle wick will stop burning before all the wax is spent. In this case, you can either toss the candle or reuse the wax. While it may be smart to pair like-scents with one another, get creative. You might be surprised how nice the new hodgepodge candle smells. Pouring candle wax is relatively simple. However, styling your candle well is what's going to set it apart and make it more easy to sell. To make your candle more rustic, consider using thick wooden wicks. Taste and smell are so closely linked that it makes sense why so many candles smell like food and drink. Tempt your taste buds with a DIY candle that smells and looks like your favorite warm drink. Beeswax burns very evenly and is perfect for unusual heat-safe vessels like lemon peels. Never leave a candle unattended​ but keep a careful eye on these DIY candles because they could burn completely in one sitting. Tea lights are easy to make when you have the right kind of mold. Simply reuse a silicone ice cube tray to make these little candles in various shapes. Just be sure to burn responsibly. This DIY candle is more about the process than it is about the end result. It's fun to watch crayons melt and make a piece of art on a candle instead of a canvas. If you want to change up the design, work with two or three crayon colors instead of an entire rainbow.